April 2019 marks the one year anniversary of the launch of Play Street Museum On Wheels! From our early days of renting U-Haul trailers and borrowing items from our various PSM locations to attend community events, we felt like there had to be a more efficient way to bring the PSM experience from within the four walls of our locations out into the community. While loading equipment into a rented U-Haul trailer for a neighborhood party in 2015 we started talking about how cool it would be if we could fix up our beat up 1989 Land Cruiser and buy an Airstream trailer that we could keep stocked full of all of these items so we could more effectively meet the market demand for an on-site PSM experience. It wasn’t until 2017 when we were sharing this dilemma with Michael and Ann Marie Tennison (future Prosper PSM Owners) that this basic idea began to transform under their leadership, hard work, and guidance into the wildly successful PSM On Wheels Initiative. Unfortunately for my husband the old Land Cruiser is still a beat up old Land Cruiser, but Michael and Ann Marie breathed life into the mobile Play Street Museum concept and have done an amazing job creating something that is truly special. Michael & Ann Marie purchased a vintage 1953 Airstream…had it gutted and finished out…complete with a little play house and farmers market. Kiddos LOVE playing and pretending inside! 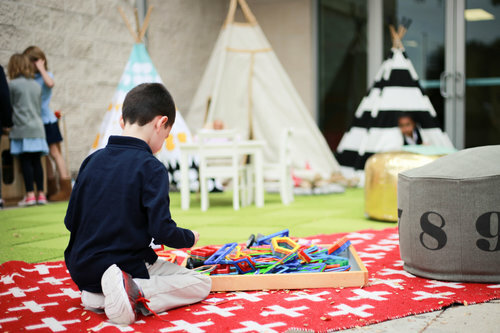 Outside of the Airstream, lays the signature green check rug found at every Play Street Museum location. It is covered by more activities that promote pretend play and that develop problem solving skills. Kiddos have tons of fun playing & pretending in the trio of teepees, along with realistic stuffed animals, fire pit and BBQ grill! 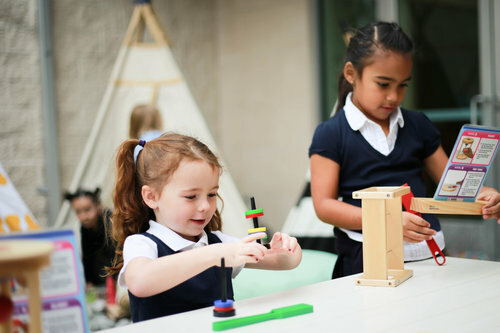 A Play Street Museum experience of any kind wouldn’t be complete without one of our favorite products that encourage children to use their imaginations while developing early math skills…MAGFORMERS! These magnetic shapes are so open ended and addicting that kiddos and adults stay engaged for a long time! When traveling to schools, the PSM On Wheels Airstream best serves the PreK-1st grade crowd. But rest assured, we have something just as engaging for your 2nd - 5th graders. Our huge HABA marble run set is a STEM activity on steroids! Cooperation, problem solving, and confidence are a few of the areas that will be exercised when building with our marble run set! Not only will the kiddos have fun, but this is a great opportunity to provide hands-on learning which has been proven to be the most productive and enjoyable way of learning! Not only have Ann Marie & Michael poured their hearts into school visits, festivals & birthday parties…they have volunteered their time and PSM On Wheels for so many community events for causes they are passionate about. 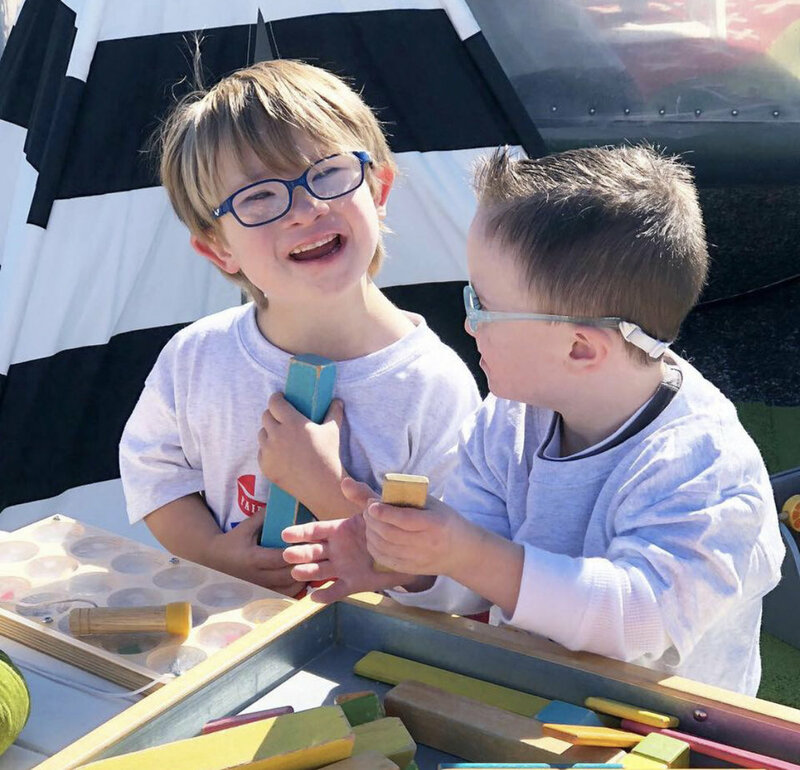 Below you can see a few pictures from the 2018 Down Syndrome Buddy Walk and Leighton’s Ride and fundraising event for Leighton’s Gift.